Because of their merry disposition, they traveled much and were often used as items of barter by sailors as they moved from continent to continent. The dogs found early success in Spain and it is generally felt that Spanish seamen introduced the breed to the Canary Island of Teneriffe. In the 1300s Italian sailors rediscovered the little dogs on their voyages and are credited with returning them to the Continent, where they became great favorites of Italian nobility. Often, as was the style of the day with dogs in the courts, they were cut "lion style." On March 5, 1933 the official standard of the breed was adopted by the Societe Centrale Canine of France. 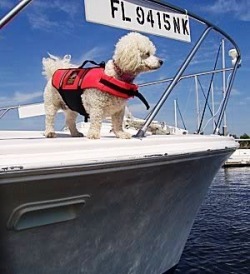 As the breed was known by two names at that time, "Teneriffe" and "Bichon", the president of the International Canine Federation proposed a name based on the characteristics that the dogs presented - the Bichon Frise. ("Frise" refers to the dog's soft, curly hair.) On October 18, 1934 the Bichon Frise was admitted to the stud book of the French Kennel Club.